Everything we see hides another thing.. The Son of Man is a 1964 oil painting by Rene Magritte who was well known for his witty and thought-provoking surrealist art. This particular piece is said to be an self-portrait and perhaps the most famous of all Magritte’s art. The painting features a man in an overcoat with a bowler hat standing in front of a low wall that overlooks the ocean. The mans face is hiding behind a large green apple – however, if you look closely you can just make out the man’s eyes peeking over the edge of the apple. Another bizarre feature is the fact that the mans left arm appears to bend backwards at the elbow creating an unnatural and slightly off-kilter body position. Breaking this down – I love the statement that “Everything we see hides another thing” so while we’re busy focusing on what is in front of us – there is a whole other reality of things going on behind that we can never see because we’re occupied with what is directly in front of us. While we may try and peek out around the object(s) in front of us and maybe catch a glimpse of the broader picture – we are still tainted by the objects that obscure our view. Or…. 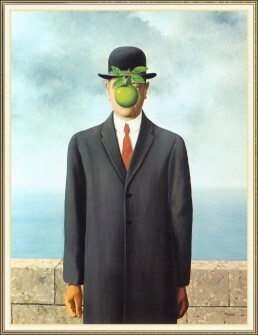 (as has also been suggested) Magritte just really wasn’t good at painting faces… so he stuck an apple in front of the man’s face to make life easier for himself! 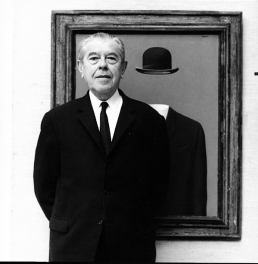 This is one of many pictures that Magritte painted with the face obscured. Some have meaningfully traced this back to the fact that his mother drowned herself in the river close by their house while he was still a child and as they pulled her from the water, her face was covered with her dress and it was this image that made such an indelible mark in Magritte’s mind that he used it in his later work.